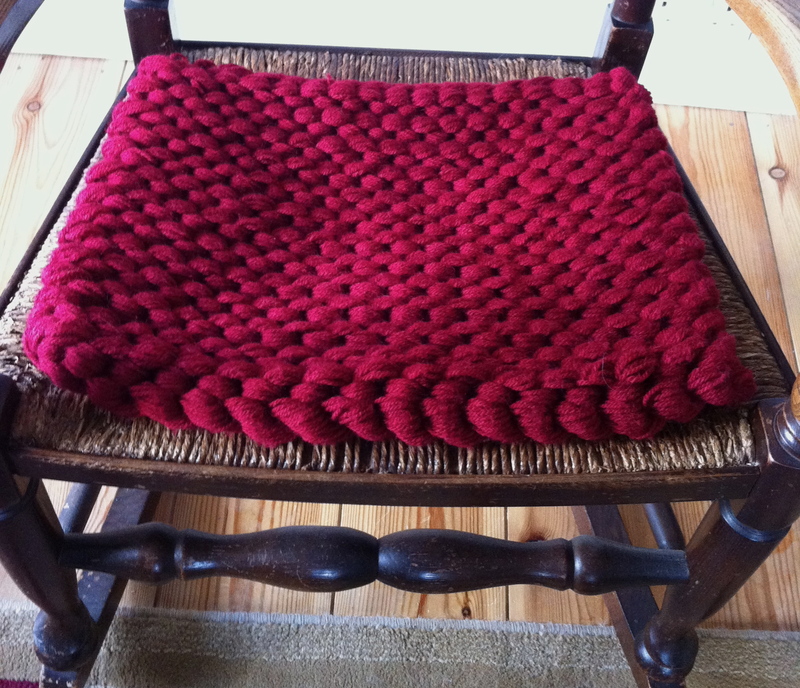 I’ve just finished this Cable Knit blanket for an Etsy customer. It’s the biggest one I’ve ever made. It fits a 5 ft wide double bed, with a 10 inch drape over either side. There are 5 cable columns requiring almost 100 stitches. I used my 25mm circular needles which my Uncle made for me on his lathe. 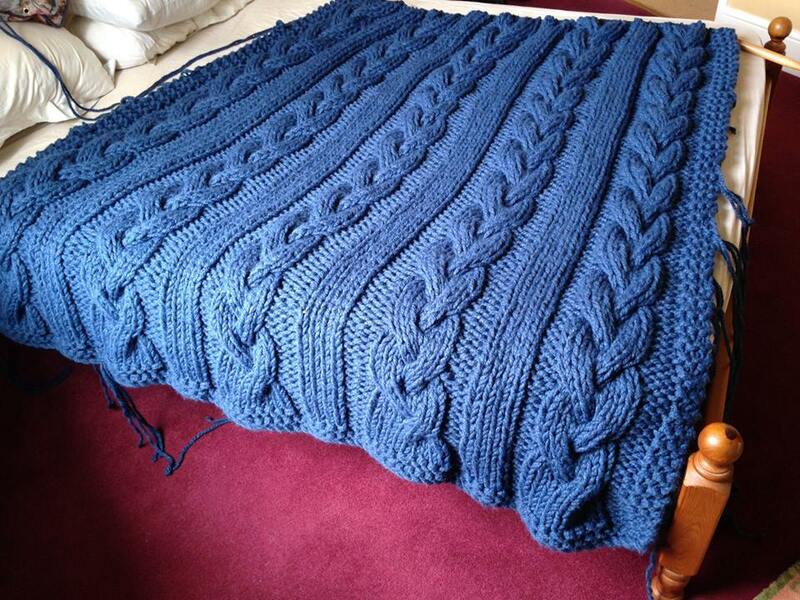 In terms of hours spent knitting, the blanket doesn’t take that long to make. But in this case it took me 4 weeks to complete, because I was away for a week on a business trip, and then I was on holiday for another week. During the time away, I had quite a lot of ‘downtime’ which would have been perfect for knitting, but unfortunately an extreme knitting blanket isn’t exactly portable! 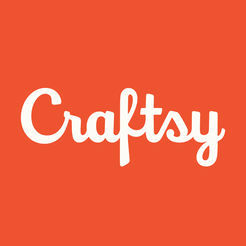 I ordered 5 kgs of supersoft chunky yarn and I used every last metre. I was joining in new balls of yarn every 5 or 6 rows. After casting off, there were seemingly hundreds of yarn ends to weave in, which was quite an undertaking in itself. I love the result though, and I think my customer has chosen a great colour. The blanket is winging its way to her now, and I really hope she likes it. I made a cushion. Not a cushion cover, but an entire cushion, in one. This is extreme knitting, folks! I started with a 400g ball of aran weight yarn. I needed 20 strands, so I took my digital kitchen scales and started winding into 20g balls. I was expecting a ‘baker’s dozen’ of yarn, but was surprised to find that my 20th, final ball of yarn weighed only 13 grams. So actually the ‘400g’ ball was 393g. Bah! I placed the 20 strands together, threw the 20 balls into a box, and started to cast on. 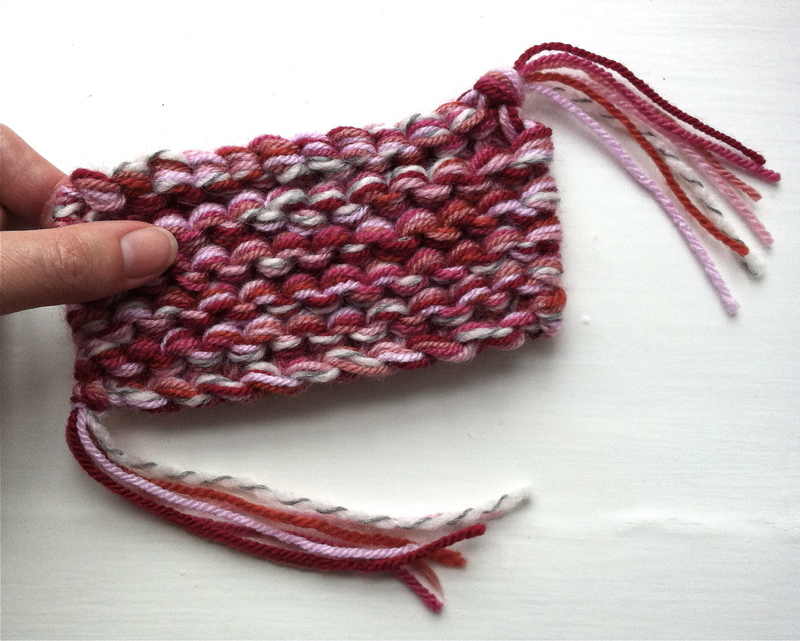 I used the knit cast-on, and I deliberately twisted the yarn a bit with each new stitch, to give a nice firm edge. One stitch equals 2.6cm (one inch), so only 17 stitches were needed. I discovered that the essential thing with this technique is to keep all 20 strands as even as possible. With every stitch I was combing through the yarn with my fingers to keep it straight. Each time I wound it around the needle, it formed a natural twist. 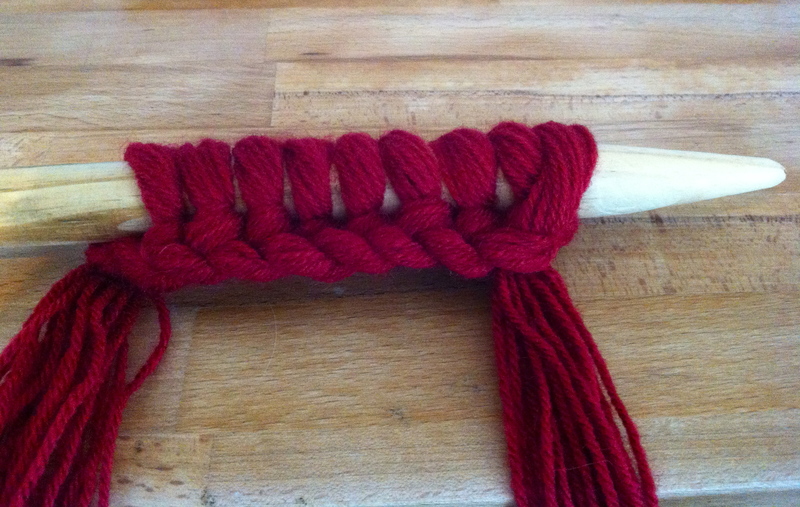 The twist gradually built up down the yarn as I progressed. Every couple of rows some untwisting and untangling was required. It took me 3 false starts before I was happy with the tension. I didn’t know how many rows I would be able to work, so I just kept going until I ran out of yarn. I was about 4 rows short of a perfect fit for my kitchen chairs. So really I need 500g for a complete cushion. The cats were fascinated by what I was up to. A large cardboard box is one of their favourite things in the world! And it was filled with little balls of yarn – second favourite. And said balls of yarn were being constantly jiggled about! This was heaven in a box for them so I had to distract them with loads of other toys and then wait till they were sleepy. What I like about this cushion is that it’s firm and soft, and it doesn’t look like you’ve just knitted a rectangle in garter stitch. It doesn’t really look like garter stitch at all. 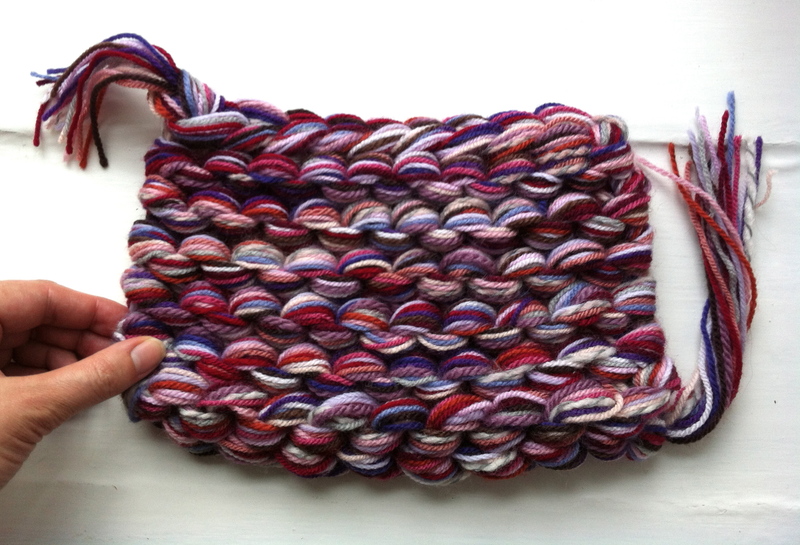 Just big, chunky ridges of yarn. Have you ever knitted on oversized needles? 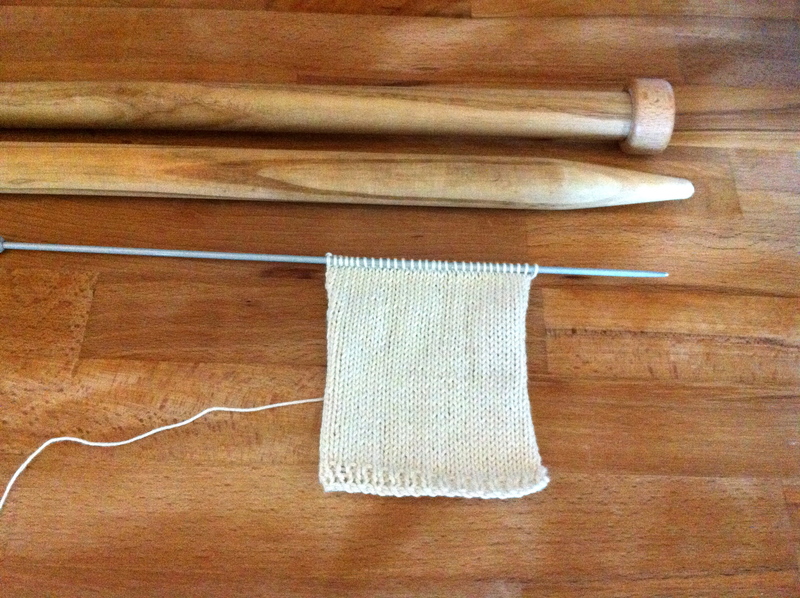 What are the largest knitting needles you own? Looking through my stash, my largest are 1cm in diameter. I can’t imagine a yarn chunky enough to knit with them. After a big of googling around, I realised I was dipping my toe into the phenomenon which is called ‘extreme knitting’ – using multi-strands of yarn on huge needles. There has even been a world record attempt by Rachel John, who managed to knit with 1000 strands. It’s extreme all right! Check it out. I placed one of my favourite No 10 (3.25mm, US no 3) needles alongside to show just how much bigger they are. Radical! I cast on 10 stitches and worked 10 rows in garter stitch. My sample measures 23 x 15 cm. That is not a lot of knitting for a piece of fabric that size. And this is the easiest, most basic stitch. Nothing fancy required. So to say that it ‘grows quickly’, would be right. But, the huge needles and 20 balls of yarn were tricky to handle. 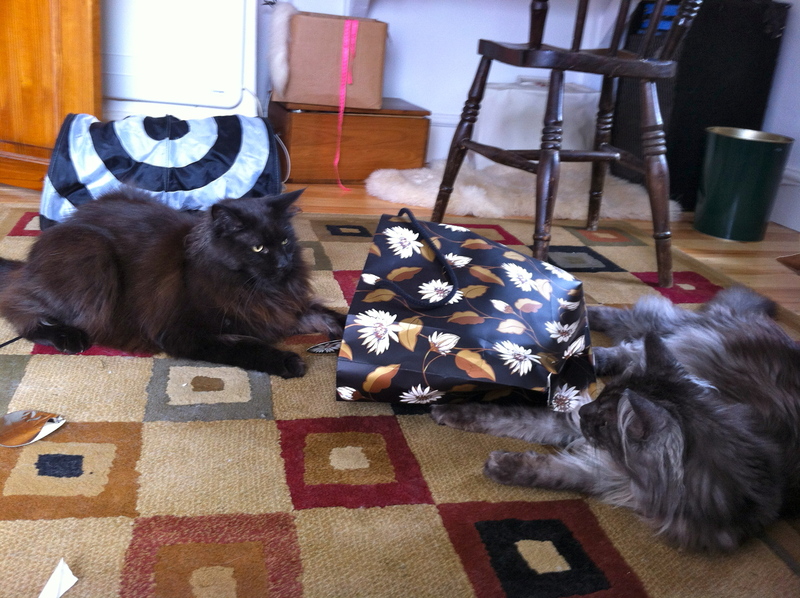 At first, the balls of yarn were flying all over the place attracting my overgrown kittens to come and play. It was like an extreme version of the black kitten in Alice Through the Looking Glass. 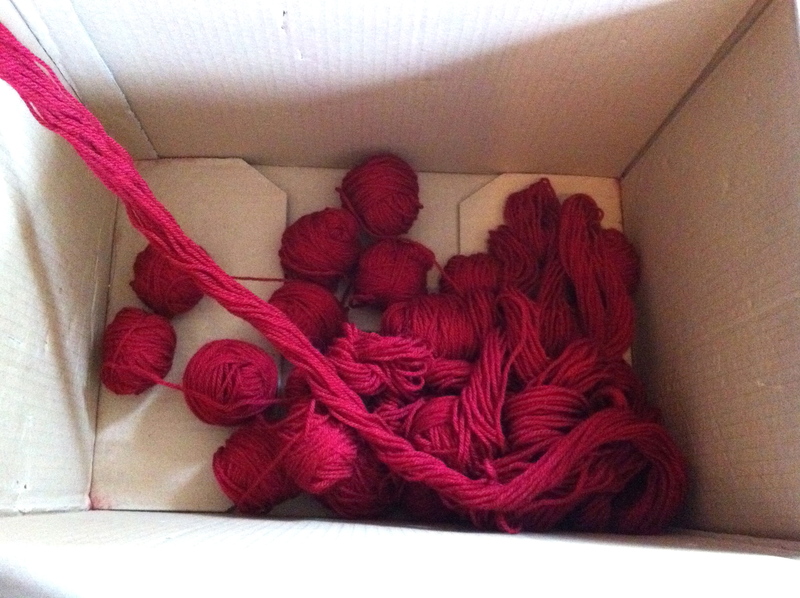 So I tipped all their toys out of their toy box to distract them, and quickly threw all the yarn into the box. That made it a lot easier. I had to make sure that I kept all the strands even. Grappling with the massive needles required some muscle. It was hardly a delicate and feminine activity. In fact, this could be knitting for blokes. The finished fabric is wonderfully thick and soft. 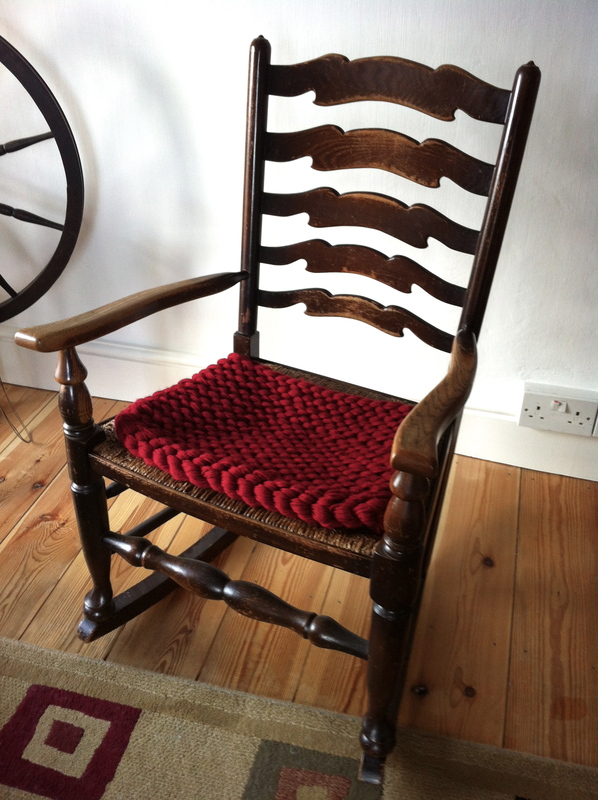 I am using it as a back rest on my rocking chair. I love how the yarn ends make an instant tassel. I also love how the different colours can produce different effects. Lots of potential here. My kitchen chairs need new cushions. 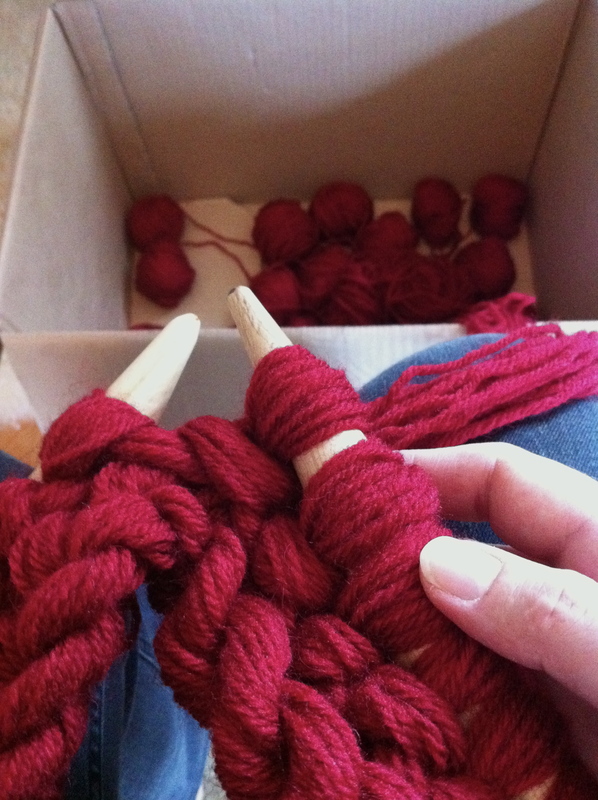 Time to go and buy extreme amounts of yarn…..